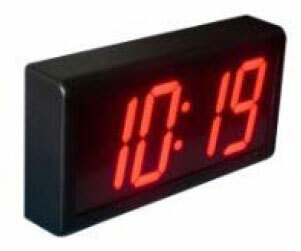 Digital wall clocks synchronised to Atomic Clock time, with 12 or 24 Hour Format, Aluminum Frame and Anti-glare lens. Now all clocks can display the same, accurate, legal time. Galleon commercial digital clocks are specifically designed for applicationswhere precision and reliability are of utmost importance. These clocks may be used as accurate stand-alone time displays. They can also besynchronized, using hard wire atomic clocks, so that all clocks display the same time. Additionally, a standalone atomic time standardrepeater may be used to transmit the true legal time to all slave clocks. This means that all clocks will not only display the same time,but the time displayed is the true legal UK time. These clocks are in use where accurate, synchronized time is required.